Just like E.T., the aliens in District 9 wanted to phone home... but maybe they weren't quite as cute. Weta's David Meng tells us he aimed to make the creatures disgusting, and they weren't originally going to be CG. As we can see from that early concept art, some of the alien designs were way stranger than the final version. Why were those rejected? Were you told to tone down the nastiness? Those designs weren't necesarily rejected outright, we just evolved away from them. A huge amount of work was done designing these things. There were so many iterations, by the time the final design was nailed down, these early images were out of sight and out of mind. The technical approach to realizing the creatures was always in flux, so that affected the look. I'd like to note that the reason the aliens in the early concept art have such human eyes was because they were, at first, intended to be actors in make-up. Due to budgetary constraints, we didn't think the aliens could be done as pure CG, which is what they ended up being. They were originally conceived as practical make-up with digital replacement over certain parts. Neill actually encouraged us to make the aliens gross and unpleasant. He was very keen that the aliens should look revolting when they were eating, and left it up to us as to what that meant exactly. So I did my take of what an open alien mouth would look like, and some viewers have been disturbed by it! They took note of the genitalia-like aspect. It's my job to disturb people sometimes, and to be honest, I was only a little worried that genitaliia-esque aliens were old hat. But I think they continue getting such visceral responses because they remind the viewer of his or her own vulnerability, not because of the shock value. In the end, that aspect didn't make it into the final alien, possibly due to censorship issues, but as I said, these illustrations were old news by then. Oh well, it's all good. It seems like a lot of the meaning of the story changes depending on how aggressive or how loveable the aliens appear. Was there ever any talk of making them cuter? Or more scary and soldier-like? Definitely for the little child alien, Neill wanted to make him very cute. I collaborated on the child alien with Jamie Beswarick, and Neill encouraged us to play up the big eyes and rounded head, etc. For the the general alien populace, Neill wanted them to be intimidating due to physical strength and size, and off-putting. I think the endearing quality of the generic aliens was due to their ineptness and victim status, one felt sorry for their plight. There was another design phase of the Prawns I personally liked, where they looked very much like those early concept images, but with larger bug eyes. That evolved further into the final aliens. Neill really pushed the eyes to be bigger and bigger, which I initially wasn't sure about, but upon seeing the final movie, I understand the decision. A lot of people seemed to prefer that. It seemed so obvious to have big puppy dog eyes, but without them, perhaps no one would care about Christopher Johnson and his kid. So the aliens were pure CG, not a mixture of CG and practical effects as you'd considered. How would that mixture have worked? And were any of the alien body parts still done with practical effects? The Prawns themselves were entirely CG, from head to foot. The alien parts on Wikus were prosthetics built and applied by Weta Workshop (Sarah Rubano and Joe Dunckley took care of the make-up work on location), and there were various alien corpses that we fabricated physically, such as in the laboratory dissection scene. Initially, the aliens were to be an actor in a suit, who would then be augmented with digital replacement in some areas, at an earlier stage we considered mechanical puppetry mixed with prosthetics. Ultimately the decision was made to have them be pure CG. The aliens in D9 are amazingly expressive — they do a lot of "acting" with their eyes and mandibles. It seems like the biggest problem for a really alien creature is getting human audiences to identify with it or feel its emotions. How did you approach this problem? That credit should mainly go to the animators and Neill Blomkamp. They solved how this thing we designed should move and emote. But from a design standpoint, it would go back to the eyes. Throughout most of the design process, the aliens had mammalian eyes with pupils and sclera, etc., so we always knew they would be able to emote warm-blooded emotions. Neill didn't go with our versions of the eyes as solid black or cephalapod pupils, so they retained a relatable humanity to them. Obviously, a lot of the press about D9 focused on its low budget. 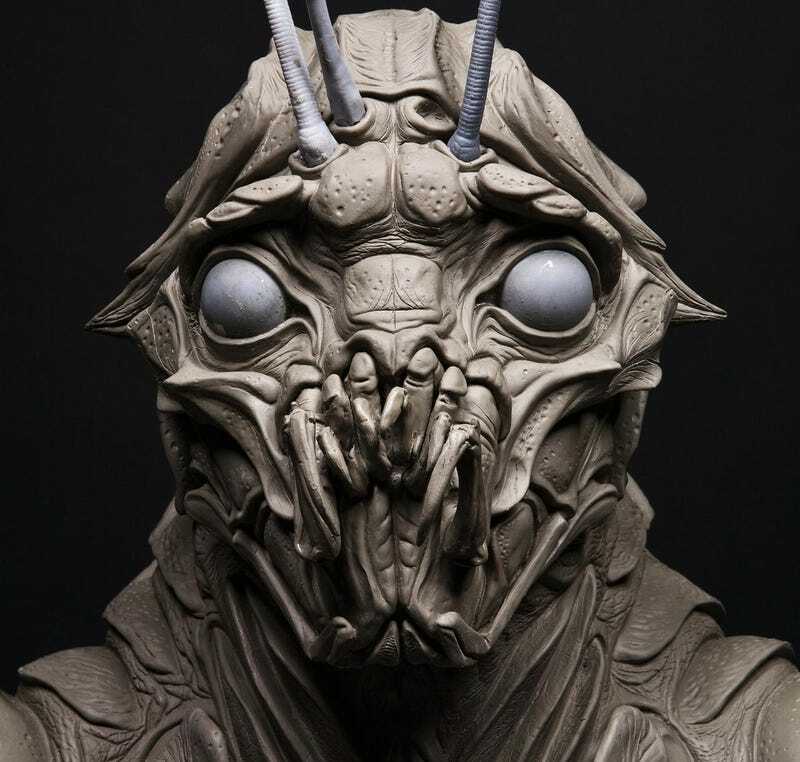 How do you create aliens who look more convincing and interesting than most big-budget movie monsters, on such a low budget? Of course, that credit goes to Neill's filmmaking sensibilities. I was part of an initially larger team of designers who were later scaled down to Greg Broadmore, Leri Greer and myself. I worked as lead creature designer, concentrating on the organic creatures. Greg designed all the robots, bio-suits, weaponry, vehicles, the mothership, etc., and was the lead concept designer. In his role as art director, he also contributed studies of the alien's body coloration, as well as some subtle last minute tweaking on the final version aliens. Leri did the graphic design, logos and costumes. With Neill directing me, I just offered up as many possibilities as I could, bearing in mind that it had to be relatable to human audiences and based around a roughly humanoid shape. Initially, we tried not to heed any budgetary or technical constraints, so as not to become creatively impaired, but those things factored in later on. Eventually, time just ran out. The aliens in the film are standing in for South Africans during Apartheid, but they don't act or appear like any human ethnic group — did you have any discussions about avoiding the "Jar Jar Binks" effect, and making them look less like members of a human ethnicity and more like real aliens? I don't remember that we did. They spoke in an utterly inhuman language and were so insectile, they didn't really run the risk of mirroring any human ethnic group. Personally, I never thought our space lobsters would strike anyone as ethnic caricatures! In the film, we got very little information about the aliens' social structure and how they came to be in such bad shape. Were you told anything more about this, during the design phase? Is it true that most of the aliens on Earth were worker drones? Did you have any ideas about what other aliens, like their Queen, might have looked like? I think the idea was that the vast majority of the aliens were workers, and that Christopher Johnson was much brighter than most. Which sort of explained why the overall population were so lost and ineffectual. There was definitely talk of the social structure of the aliens during the design phase. It factored into how we designed them. There was a lot of stuff designed and talked about that never made it into the film. It's possible that Neill may want to save some of these ideas for other future projects, so I don't know if I should talk about it.